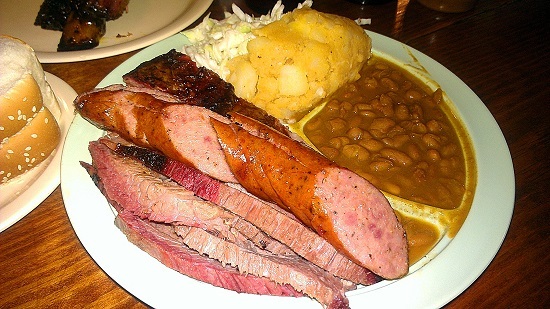 The first restaurant on the Austin eat list was the Salt Lick, chosen, in part, because its TV reputation had set the bar high for the rest of the places on the list. It was a 40 minute drive from downtown Austin to a gorgeous rustic destination restaurant in the middle of nowhere. The wait was 45 minutes as the place was packed on a Friday night. 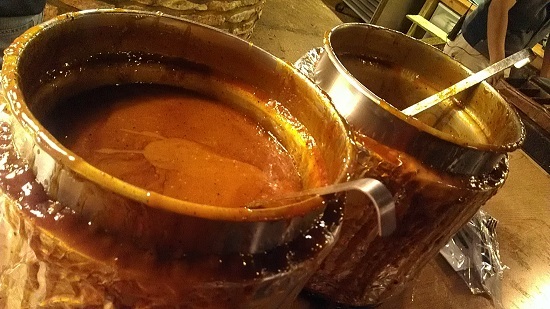 Salt Lick had the most stupendously delectable finishing pits I’ve seen anywhere in the country. Although the meat was cooked behind the scenes in large Oyler Pits in the back kitchens, the meat was kept warm in open pits right when you walked into the seating area. I loved the look and vibe of this place. The brisket, sausage, and ribs looked beautiful. Unfortunately, flavor was lacking and meats were not tender. Ambiance was superb and it looked and smelled like a fantastic barbecue place but unfortunately, the food was underwhelming. The scoring reflected the eating impressions and it finished 13th place out of 15 places sampled. Not an auspicious start for a barbecue crawl. 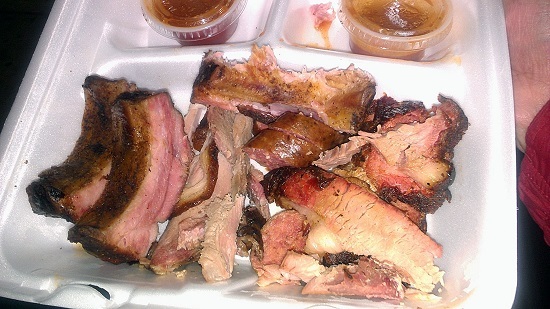 The 40 minute drive back to Austin felt a little surreal as I marinated in the disappointment with the Salt Lick which I had expected to be mind-blowing good. Next up was Stubbs Bar-B-Q, which started in Lubbock, Texas, in the 1930’s. 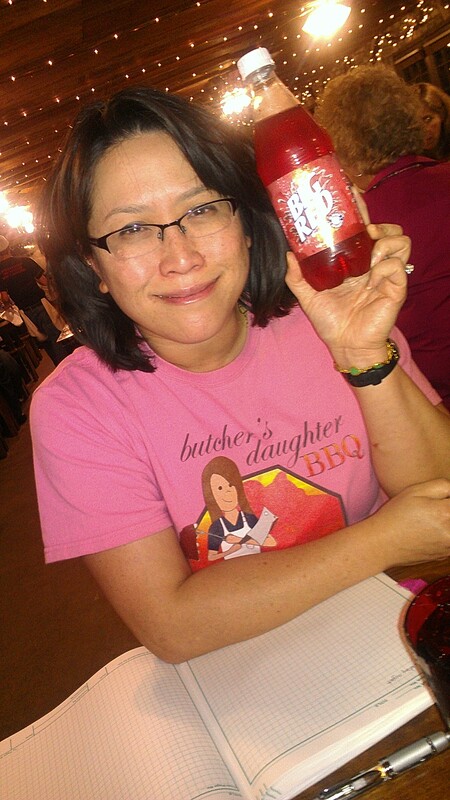 Lubbock is also home to Texas Tech, my alma mater, where I tasted my first Texas brisket. I also like to use C.B. Stubblefield’s aka Stubbs marinades for my pork and brisket and was eager to try his flagship restaurant located on Red River Street in downtown Austin. There was no line and we were seated right away. 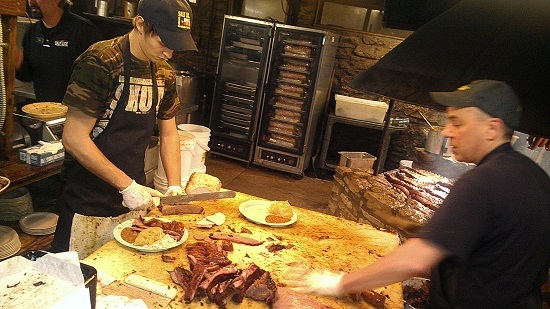 A quick glance of the menu showed they had the standard repertoire of barbecue items so we ordered immediately as we were hungry as we did not eat much at the Salt Lick. Overall my mouth was happy. The brisket flat slices were impressive with the right amount of smokiness, great flavor, moist, and competition pull-test tender. I really liked it. The spareribs had a dark crust with beautiful smoke ring. Rib tenderness was good and flavor was average. The sausage tasted like homemade and was quite good. Despite the chain restaurant look and so-so décor, I had good barbecue at Stubbs, enough to score it 5th out of 15. The next restaurant on the list was Danny’s which was a Yelper’s favorite (yelp.com food rating site) and a short 10 minute walk from Stubbs. 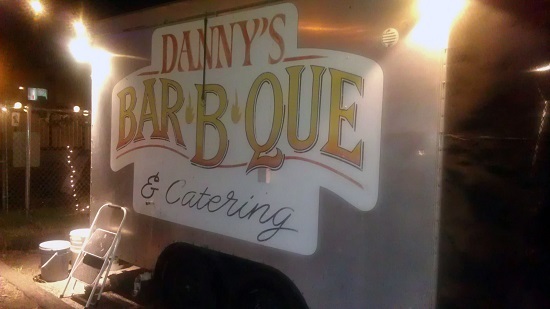 Danny’s was a little barbecue trailer in downtown Austin. Allen Mack the owner used to work in luxury car sales and made the jump into barbecue because Danny asked him for help to run the trailer. He ended up owning the trailer and had been cooking for about 5 months on his own. Allen was a super friendly and personable guy and you could feel his warmth and love he put into his food. Brisket was very good and he also cut it fresh off the pit which may contribute to the superb taste and texture. He also served baby back ribs which was cooked they way I like to eat my ribs with no sauce, salty and peppery, and a bit chewy. His Elgin-style sausage had great flavor and nice snap when you bite into the casing. Elgin is a town close by that’s famous for its sausages. Allen also let us try his pork roast. 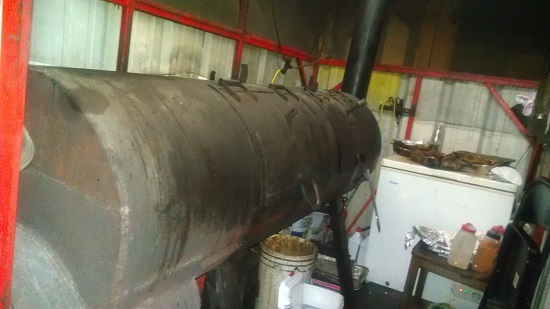 He does a great pork roast on his pit which is unusual for this area. Mack’s scored mid-pack coming in at 7th place out of 15. 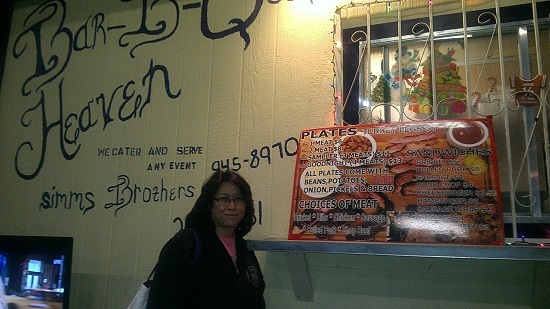 It was getting late and it was a long walk back to the spot we parked the car when we ran across the fourth place we tried at Bar-B-Q Heaven which was a night owl joint that was open until 4 am. We ordered the combo and sampled the meats. We also got a tour of their big pit. 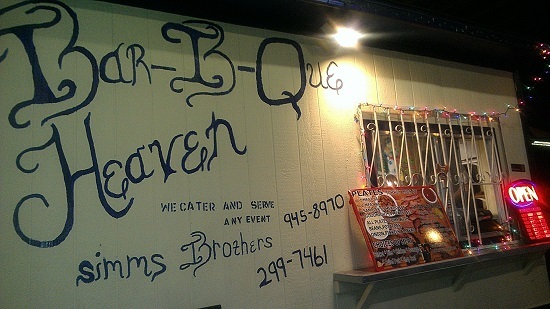 Overall, the food was so-so and Bar-B-Q Heaven finished in 12th place. It was a long day travelling from California and working our way through four places after we landed so we called it a night. We had to get up early the next morning (with a 3 hour time difference) to stand in line for Franklins, reputed to be the best in America. I could hardly wait. . . .
We landed in Austin at 4:30PM and by 7:20PM, we had rented a car, visited HEB market (Harry and I took photos of brisket packers and pig heads in the meat section), checked into our hotel, unpacked, driven 23 miles southwest to Driftwood and got a pager from the hostess. From what I could tell, Driftwood was an appropriate town name for the Salt Lick location. We had wasted 20 minutes earlier in the day trying to cajole my GPS to tell us where 6505 Interstate Highway 35 North was located. Honestly, it didn’t seem like a normal address. During our entire stay there, my cell phone never figured it out. I don’t blame it one bit. So when we approached Driftwood and there was nothing but complete darkness around us, I had wondered if my GPS had given out on us again. There were two more restaurants to visit that night. We were 33 minutes committed to getting to one of the most famous restaurants in Texas and we didn’t have much time to waste. Luckily, out of nowhere the Salt Lick appeared. We entered a huge gravel parking lot that brightens all of Driftwood. We could see the restaurant off in the distance from where our car was parked. When we got near, we realized that the first building was Salt Lick Cellars, which sold wines locally produced on the 35 acres owned by the Roberts family. There were two other buildings, one called Pecan Grove with big windows and big enough to cater weddings. The other smaller building housed the Oyler smokers in the back and handled all the to-go orders. Both buildings had a gorgeous round open pit for meat that was about to be served. 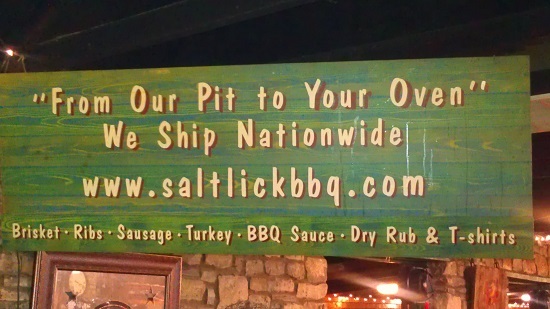 The Salt Lick is famous for these two pits and smartly places them right in front. The hostess will invited patrons to walk around them and take photos. The added spot light makes the hanging sausages, brisket and ribs glow and with burning oak coming up from underneath the meat, it was really something to admire. 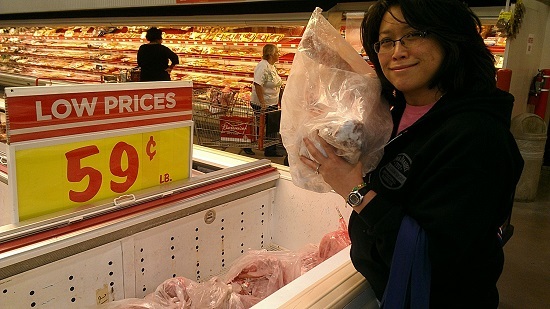 In order to serve an average of 3,600 lbs of meat each day, the kitchen must be efficient. There is one guy whose main job is to scoop out potato salad and beans. Another guy mostly slices sausages. The third guy slices the brisket and the ribs. Salt Lick has an all you can eat menu and the servers come right back to the prep guys with an emptied plate and will wait until more meat gets plated. All of this is done out front so you have something to visually enjoy while you wait for your meal. 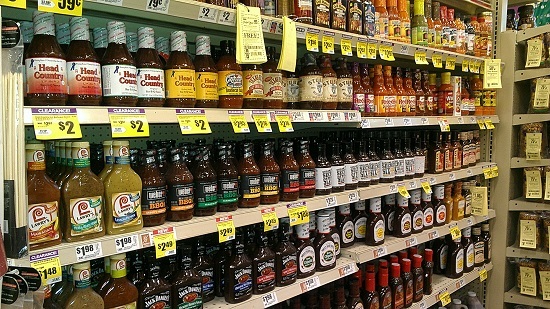 Everything gets topped off with their mild sauce, unless you ask otherwise. It amazed me how hard these guys worked, moving meat around and getting orders to the wait staff. After 40 minutes, our pager flashed and our logistics lesson was complete. We went to the first hostess who directed us to the next hostess who directed us to yet a third hostess. The BBQ compound was intricate and complex. We were finally seated and ordered our food. 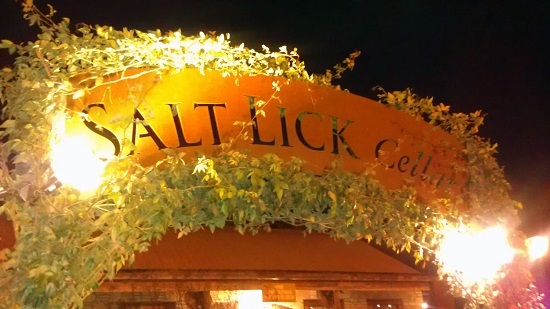 The Salt Lick doesn’t serve beer at the restaurant but welcomes diners to bring in their own, which explained the large number of coolers that entered the thin walled building (for a moment, I thought I was at a BBQ contest). So we ordered a Big Red soda, common to central Texas, and a three meat combination with sauce on the side. Our young waitress served us two orders of a three meat combination and two sodas. To our disappointment, nothing was particularly notable. It was not horrible but it wasn’t what we had hoped for in our minds. 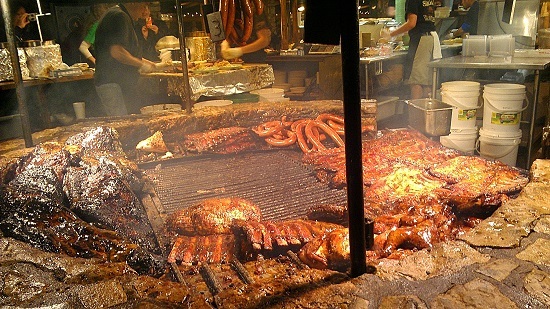 Yet, the experience of watching food being prepared, seeing the numerous buildings, our amazement at how many people visited the Salt Lick and seeing the gorgeous pits were all good enough reasons to have visited this place. We ate more than we should have and were thankful that the trip to Stubb’s was 40 minutes away back in downtown Austin. 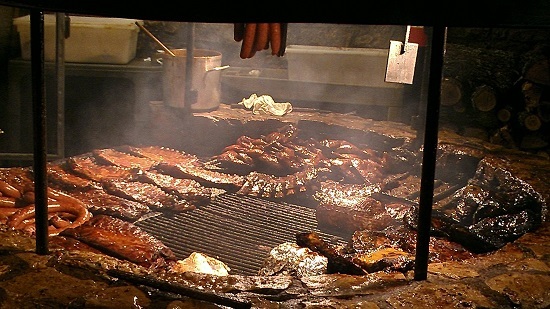 Our food at Salt Lick was served at eight o’clock and by 9:10PM, we were already eating at Stubb’s. There was no wait at this hour. The cold December weather made us hustle a little faster from our rental car to the restaurant. When we got there, we were welcomed inside of a sturdy brick building with heating and the refinements of a modern restaurant. Stubb’s is known for serving great side dishes and good music. No one really talks about the BBQ. But I felt compelled to visit and I was glad that I did. A veteran waitress took our order and within 10 minutes we were eating fried green tomatoes, sausage, pork ribs, brisket, Serrano cheese spinach and fried okra on the side. 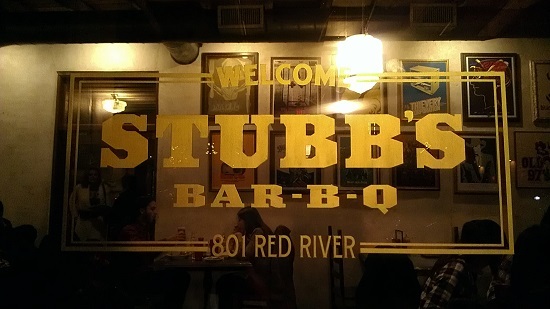 I took a bite out of the brisket and was so very thankful to Stubbs for serving me some great slices of brisket. I cannot be certain whether I was over-reacting to my previous experience in Driftwood, but gratitude best expressed my feelings at the moment. My trip to Austin was not in vain. 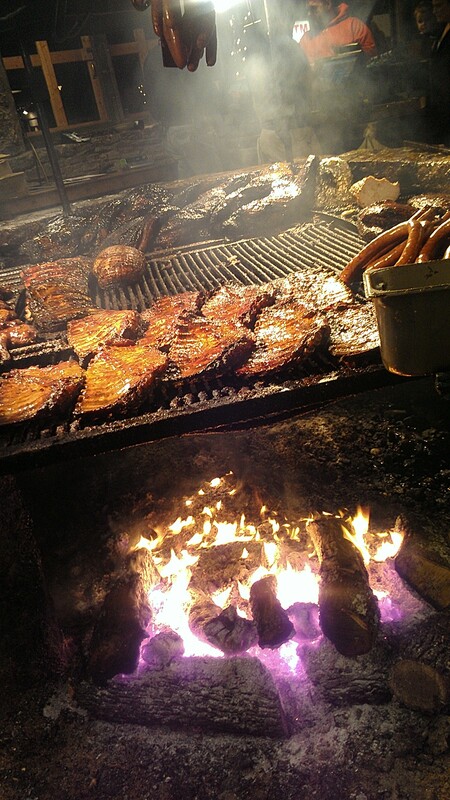 There was good BBQ in Texas and it was being served at Stubbs. 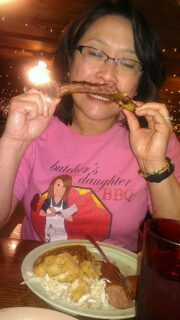 The sausage and the pork ribs were also good, particularly at 9pm at night. And the Serrano cheese spinach turned out to be the fanciest side dish we were going to get that weekend. I was thankful to Stubbs. We then moved on from the big names to the small ones that no one ever talks about: except yelpers. The next two establishments were highly rated on the internet and both were within walking distance of Stubbs. Given how cold the night was, we normally would have driven the distance but the weight of our two meals within 1.5 hours justified a 10 minute walk to Mack’s. 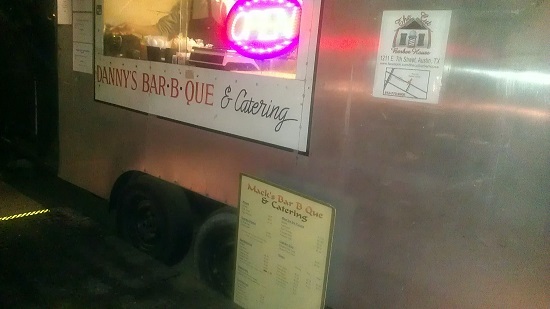 Earlier that day we had passed Mack’s food truck on our way to the hotel. When we arrived, we found ourselves in a small gravel lot with two food trucks facing each other. Allen Mack, who was pushing the burning coals of oak around in his pit, looked up and greeted us from behind a steel fence. We walked around the post to say hello. He asked us what we were up to and I explained that we were interested in tasting his BBQ. 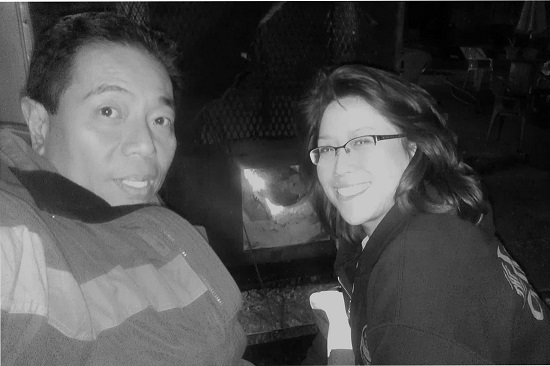 His eyes brightened and he told us he would stoke the fire and put two chairs in front of the pit to keep us warm. The owner had no idea who we were and I had read in free credit score reviews how nice he was and indeed, everyone was right. Allen had a gentle nature and the compassion of caregiver, not qualities you’d expect in a pitmaster. Of all the brisket I tasted in Austin, Allen made the most flavorful slice I had. We talked to him for quite a while afterwards and found out that he took over the business from a guy named Danny (which explains why the truck said Danny) six months prior. This was still a new thing for him though barbecuing was a tradition handed down to him from his father. Even though Allen liked his previous job, he never loved it like he loved cooking barbecue. So he went with his heart and took over the business. Before we left, he told us one story about a drunk who spilled out of a taxi cab one day and ordered some barbecue. Allen served him and thought nothing more of it. A few days later, the same taxi cab driver said the same drunk guy was stuck at Stubbs a few blocks over and sent him there to order 6 chopped brisket sandwiches so he could eat them at Stubbs. We laughed with him and relived the proud moment. 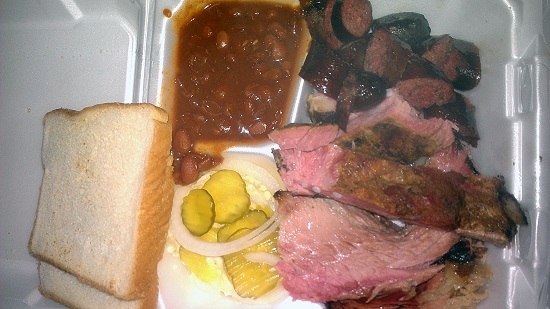 On our walk back to the car, we ran into BBQ Heaven, which is just down the street from Stubbs. Our fourth joint for the night was lauded for their chopped brisket sandwich. I almost passed on this restaurant but Harry was not to be dissuaded and ordered a three meat combo. 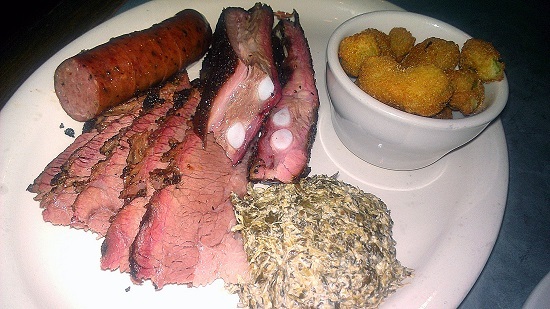 The holy trinity in Texas is brisket, sausage and pork ribs. The holy trinity is what we ordered, for the fourth time that night. We shot a few photos of the food truck and then of the food. I then wrote down our scores in my black notebook. The lady who took our order noticed our activities and asked who we were. We didn’t tell her but we did say we were from California and were visiting Austin to eat BBQ. She asked if we wanted to see the pit in the back. We said yes and she explained that the brothers who ran the pit had 35 years of experience behind them and that’s why the BBQ is so good. There was apparently a bigger one somewhere else which allowed them to have the 4PM- 4AM business hours. By the time we made it to BBQ Heaven we could barely eat anything, though we did take one bite of everything. We decided to keep the BBQ leftovers in their original container and label it. Into the trunk it went as did the rest of the leftovers for the weekend. At night, the temperatures delved into the 30s-40s so the car made for a good refrigerator which our hotel room did have for us. By the end of the trip, the floor of the trunk was filled with Styrofoam boxes and meat wrapped in pink butcher paper, all labeled with the proper institution. It was quite a sight to see.